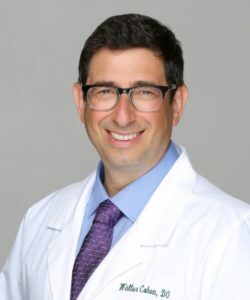 Walter Cohen, DO is a Board Certified Osteopathic Doctor who joined the team at Guarneri Integrative Health, Inc. at Pacific Pearl La Jolla in 2017. In 2001, Dr. Cohen discovered a talent utilizing his hands to be of service as an agent of change helping people realize their own body’s capacity to self-heal and self-correct. This discovery came after 17 years working in New York City as an assistant director and location manager on 14 feature films, six seasons of network primetime dramatic television series and hundreds of commercials and other special projects. Two years later, Dr. Cohen left film production and NYC and completed a 1000-hour licensed massage therapy training program at the New Mexico Academy of Healing Arts in Santa Fe, NM. There, he also certified in, and subsequently table trained others, in a 150-hour Cranial Sacral Therapy course. He practiced massage and cranial sacral therapy for six years in Santa Fe, NM. Dr. Cohen learned Cranial Sacral Therapy and many other beneficial therapeutic techniques originated in a medical science called Osteopathic Medicine. Intrigued, he began going to a Doctor of Osteopathy for regular treatment for his own musculoskeletal condition. For four years he had suffered without relief from treatment by medical doctors in a variety of specializations including sports medicine, chronic pain management, PMR and orthopedic surgery. Physical therapy and massage also provided no relief. After receiving eight treatments over a few months by the osteopath, four years of Dr. Cohen’s suffering was completely alleviated and has never reoccurred. Twenty years earlier, he had graduated with a Bachelor of Arts from the University of Wisconsin-Madison with a major in Theatre, Film and Television. Now having experienced what Osteopathic Medicine could do and wanting to serve at his greatest level of skill possible, Dr. Cohen returned to school to complete all the medical school science pre-requisites. He was accepted into the West Virginia School of Osteopathic Medicine and four years later graduated with the degree, Doctor of Osteopathy. He completed an internship year in general medicine at Berkshire Medical Center in Pittsfield, MA followed by a two-year residency in Neuromusculoskeletal Medicine and Osteopathic Manipulative Medicine at Northeast Regional Medical Center in Kirksville, MO the birthplace of osteopathy. Prior to starting osteopathic medical school, he had the privilege of studying for 550 hours over three years with Steven Weiss, DO who views treatment of the body as a structural engineering problem. Dr. Weiss trained him in a specific algorithm to resolve emotional and spiritual shock and trauma that goes in to the physical tissues of the body and was created in Weiss’ own efforts to help his patients in New York City post 9/11. Having completed Cranial Osteopathy courses with the Sutherland Cranial Teaching Foundation and the Cranial Academy, Dr. Cohen is now a full member of the latter and considers Cranial Osteopathy one of his specializations. He continues to study Osteopathic Manipulative Medicine including multiyear studies of Biodynamic Cranial Osteopathy with Dr. James Jealous, visceral (organ) manipulation with renown French osteopath Jean Pierre Baral and pediatric osteopathy at Viola Fryman’s center in San Diego. Neuromusculoskeletal Medicine and Osteopathic Manipulative Medicine, Structural Issues, Pain, Joint Health. Gastro-Intestinal, Respiratory and Cardiac Issues related to Somatic Dysfunction/Structural Issues. Cranial Sacral Therapy, Biodynamic Cranial Osteopathy, Visceral (organ) Manipulation, Pediatric Osteopathy. Doctor of Osteopathic Medicine – West Virginia School of Osteopathic Medicine.Cranial Osteopathy – Sutherland Cranial Teaching Foundation and the Cranial Academy. Cranial Sacral Therapy and Massage – New Mexico Academy of Healing Arts, Santa Fe.BA – University of Wisconsin-Madison. Internship in General Medicine – Berkshire Medical Center in Pittsfield, MA.Residency in Neuromusculoskeletal Medicine and Osteopathic Manipulative Medicine – Northeast Regional Medical Center in Kirksville, MO. A Doctor of Osteopathy (D.O.) is a fully licensed physician and is similarly educated and certified to Doctors of Medicine (M.D.). The Osteopathic doctor’s focus is to serve as an agent of change to alleviate acute and chronic pain, physical limitations and diseases by utilizing their hands to change anatomy and physiology to improve your health. There are some differences in their medical training and philosophy of patient care. The osteopathy philosophy involves treating the mind, the body, and the spirit. It’s a more holistic approach than conventional MDs. The osteopathic approach more on the body trying to heal itself and is less about prescribing medications and medical procedures. Osteopathic doctors are also trained in a diagnosing and treatment technique called osteopathic manipulative treatment (OMT). With this method, D.O.s use their hands to feel your body, probing for telling signs like alignment of your bones and joints, swelling, and muscle spasms. Osteopathic doctors may provide manual medicine therapies, such as spinal manipulation or massage therapy, as part of their treatment. Those suffering from a chronic pain or a musculoskeletal condition like fibromyalgia often experience benefits when served by a D.O. as well as many other health concerns such as pain, structural issues, gastro-intestinal, respiratory and cardiac issues related to somatic dysfunction/structural issues, and joint health. It is strongly recommended that patients wear athletic wear or sweat clothes for their appointment. Testimonial: “I was at Dr. Guarneri’s clinic in October, and was most fortunate to have an appointment with you, Dr. Cohen, that day. You mainly worked on my hip area, and it led to 2 days of feeling like a normal person–after over 20 years of feeling far from that. It was obvious to me that you knew, intuited, what you were doing!! !” –Susan Walker, 2018.